The Teamsters Joint Council 16 (IBT) is committed to protecting your privacy. This page explains how the IBT’s Communications staff gathers and handles information from visitors to the Web site and reflects our dedication to securing the information you entrust with us. The only personal information Teamsters.nyc collects is what you voluntarily provide through online registration forms, purchases or e-mails. This information may include your name, e-mail address, street address, phone number, membership status and local union affiliation. We do not store sensitive personal information. Although, we do use the last four digits of your Social Security number to validate union membership, that information is not stored on our web servers. The information is checked against our secured membership database and deleted after authorization is granted. Teamsters.nyc provides personal information on a secure and confidential basis to third parties that have contracted with the IBT to offer services that it cannot offer on its own, such as selling merchandise, offering travel services or sending e-mail alerts. These third-party providers are required to protect the privacy of IBT members and site visitors. They must safeguard your information and can use it only to complete the purchases or tasks you’ve authorized. In accordance with the Children’s Online Protection Privacy Act (COPPA), Teamsters.nyc does not knowingly collect, use or distribute personal information on children to any third party. Agreements with third-party vendors require they use secure servers and Secure Socket Layer (SSL) encryption to protect the transmission and processing of payments and financial information. These agreements state that the vendors may store your information in order to make future purchases easier. Review the privacy policies of each Teamster partner for more details. IBT also has security measures in place to protect against the loss, misuse or alteration of information collected from visitors to the web site. Teamsters.nyc also collects nonindentifying information to help the IBT monitor and analyze usage patterns and web traffic, including the name of your Internet service provider, the browser you are using, the web site that referred you, the pages you visited while on the site and the date and time of your visits. We use this information on an aggregate basis to generate statistics that help us improve the usefulness of the site. 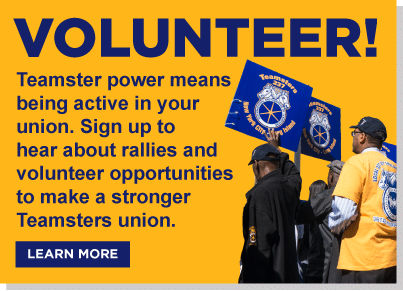 Teamster.nyc will only send email that you have signed up to receive. If you wish to stop getting email from us, choose the “opt out” link in the message or write to info@teamsters.nyc. Teamsters.nyc does not send unsolicited email nor does it send emails requesting personal or financial information. Delete emails you believe to be suspicious.